On the 17th of May, 27 engineers and scientists related to the oil and gas industry gathered in Northwest Houston to learn more about COMSOL Multiphysics applications for well logging. This area of research and development is of particular interest to the oil services companies, who make tools that help maximize the output from wells. These tools are highly advanced technological devices. They work by being inserted into a wellbore and detecting how much hydrocarbon (e.g., oil) is in the surrounding earth (called the formation). Electric field near borehole generated by a galvanic resistivity logging tool. There are several types of tools including sonic (which use piezoelectric transducers), resistivity (using electromagnetic currents), and nuclear magnetic resonance (NMR). The technology has been around since the 1920’s, but has arguably never been more important. The workshop started with a general introduction to COMSOL. Then, guest speaker Tina Zhao from Schlumberger presented her work; “Using Superposition Principle and Edge Current Model to Compute Impedance of Coil in Logging Tool”. Everyone appreciated the insight she showed in using COMSOL to design better inductive logging tools, focusing on the coil placement on the tool. Several follow up questions were asked, from the general context to the particular COMSOL implementation. A demonstration of the performance of sonic tool near a wellbore followed. 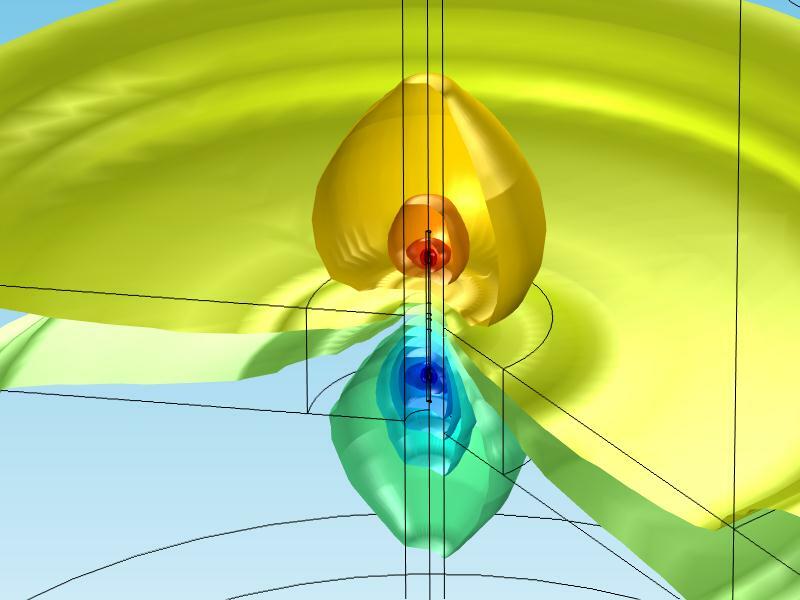 Step-by-step, the audience got to see COMSOL in action. The end result was an analysis of the measured pressure in the frequency domain. After a short break, the workshop reconvened for the “main event”: a hands-on minicourse of building a simulation of the near-wellbore performance of a galvanic tool. One of the audience members, Sushant Dutta of Baker Hughes, provided the inspiration for many aspects of the exercise, including reasonable arrangement of the electrodes. Everyone collaborated, asking questions and helping each other through the model. In the end, everyone completed a model of the electric current flowing through a formation that varied in resistivity. 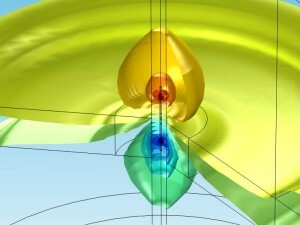 They even completed a parametric sweep of the tool as the depth varied from 10 to 35 meters. COMSOL Workshops are held every week throughout the world. See www.comsol.com/events for one near you. If you’re interested in well logging, contact the author at david.kan@comsol.com. The workshop material is available upon request.